It was into the shadows and winter of this world that Christ came to bring us the light and warmth of His salvation. 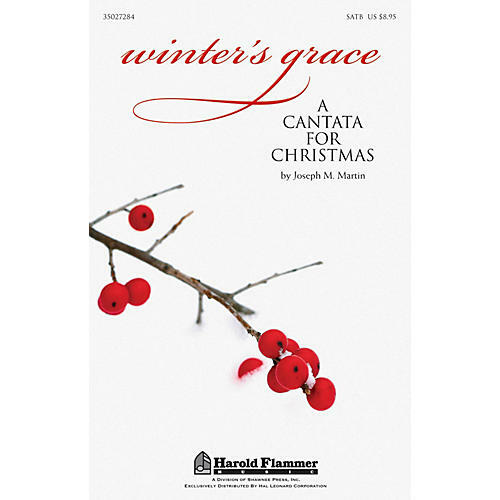 This new cantata, Winter's Grace, from renowned composer Joseph M. Martin celebrates this great light and washes the sanctuary with the messages of hope, peace, joy and love using a program of candles, Scriptures, prayers and music. The incorporation of familiar carols will engage the listener and ease the learning process. A full line of support products is available to facilitate your presentation of this dramatic new work including a digital resource kit featuring art work, PowerPoint visuals, a Bible study, practice hints, interpretive movement options, plus other helpful aids to make your presentation a success. Includes: A Winter's Song; Celebration for Advent; Hope, Peace, Joy and Love; Carols of Adoration; Let the Earth Resound With Praise! ; A Silent, Holy Night and more. Available: SATB Book, Listening CD, Preview Pack, Print Orchestration, iPrint Orchestration, StudioTrax CD, RehearsalTrax CDs, 10-Pack Listening CD, Digital Resource Kit. Duration: ca. 45:00.